I am still strugling with parting off. I make sure the tool is square to the work. I use cutting fluid. So any idea why its defecting, too thin a tool, its 2mm. Would I be better using a 3mm tool instead? Do you lock the carriage and top slide? Reduce the amount of tool sticking out from toolpost may help a bit. Assuming that the tool is indeed advancing at right angles, you could try swapping out the tip; the present one may be cutting unequally across its width. Difficult to say from the photo but it should be examined critically under a lens. On a deep cut you may find it better to set the tool projection so it will go half way and then set the tool further out of the holder to complete the cut. Could be that you are using much to slow a spindle speed and too fast advancement. I find these tip tools cut much better at higher speeds. What sort of speed would you advise? Fit a rear tool-post then all should be sweetness and light with great rejoicing in heaven and on earth. What sort of diameter are you cutting as that will affect speed. I seem to manage OK without a rear post and a similar 2mm blade, 1/16" slice off 2.5" cast iron and less than a thou variation in thickness! I use a 2mm inserted tip parting off tool with great success on my Myford ML7. It is fitted in a quick change tool holder. I used to struggle with parting off, things improved when I discovered the carriage lock! and again, years later, when I purchased the inserted tip tool from JB tools. I have a rear toolpost but haven't felt the need to use it, as yet. Did you use tailstock support and if so at what stage did you retract the centre? But I make a rod for my own back, even with the saddle locked, by grinding the HSS tool with an angle on the front, to minimise a "pip" on the workpiece. I do not expect a slim tool, or tool holder not flex, so after parting off, I face the end of the work, which also gives a better finish. Any slight force will deflect the tool or the holder in the case of inserted tips. hence Jason's advice to cut a little, and then advance the tool, until the cut is complete. Parting off with the tool mounted on a back toolpost causes much fewer problems. I work on a Sieg SC3, use a HSS-Co8 parting blade clamped in a home made holder that clamps the blade in the side face. The blade has no top rake, only ground on the front. HSS-Co8 is much tougher than a straight HSS blade, the ones I use are I assume Chinesium but they work. When I first had the lathe I had a carbide insert holder, but gave up on it after having to use a HSS blade when the supplier was shut. Saddle is clamped to the bed, after positioning. Compund slide is tightened but not fully clamped, the reason for this is so I can make a wider cut than the single blade width. I do this so that the swarf clears the side of the blade, I take a plunge cut, then move slightly to the side to take a second as I move the blade in. Cutting speed is around 400RPM, dependant on diameter, adjust to suit diameter as you feel confident. Don't overhang the compound slide from the cross slide as this will allow movement on a small machine. I have cut unto 75mm diameter in steel, it took time but it did cut. Use a cutting oil to keep the tip cool, I use a spray cutting fluid from Toolstation. Most of my work is with steel, softer metals like brass and phosphor bronze are less of an issue. Looking at you photo of the tool, I'm thinking I can see a tiny wedge of support on the lower edge of the insert location that suggests the insert is skewed rightwards. Can't tell if the insert is properly vertical or not, but if it isn't the right-hand side of the tool might be rubbing, unable to cut, and so forcing the left-hand side to dig in further and deflect the supporting blade that way. The fact that there's also a significant bit of the support projecting forward underneath the insert suggests to me that there's summat up with its location. I also noticed that Mick, maybe the holder has been twisted in a previous lock up. If you are cutting 38mm ali then why do you have a good 35mm plus of tool sticking out? I can see the "2" showing part way along which indicates 20mm projection and that is enough to go through 38mm stock. Speed wise put it in the slower speed range but run towards max 900-1000 and feed briskly. I recently turned a set of buffers from 35mm dia ali and Jasons advice above is pretty much what I found worked for me using a 1.5mm HSS tool. Moving up to a 3mm tool I would avoid if my experience with one is anything to go by. 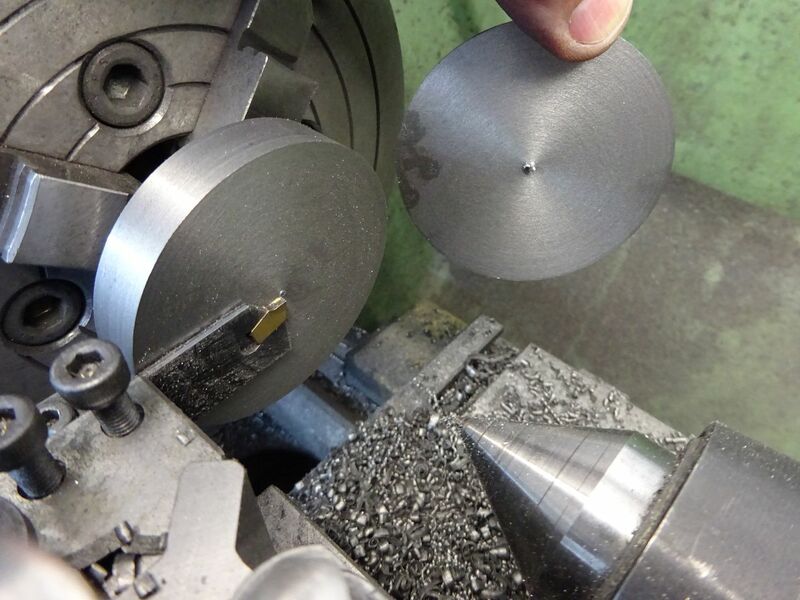 If you are using a mini-lathe as I am I would argue that a 3mm parting tool is too much for them. I have a HSS 3.2mm tool and the lathe just doesnt like it, even with ali, I tried everything I could but it was not happy.